John Huston’s film noir KEY LARGO is a personal favorite, and a bona fide classic in its own right that works on many different levels. 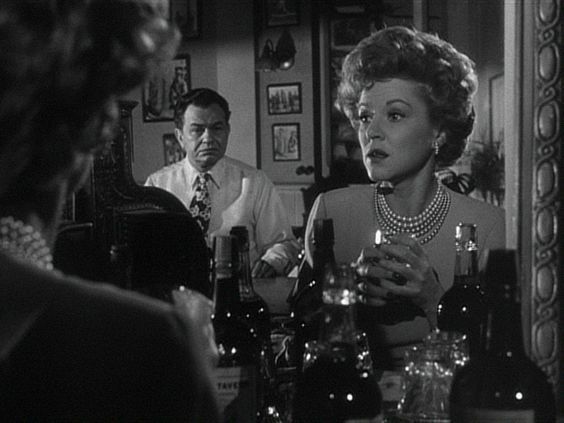 Much of its success can be credited to the brilliant, Oscar-winning performance of Claire Trevor as Gaye Dawn, the alcoholic ex-nightclub singer and moll of gangster Johnny Rocco (played with equal brilliance by Edward G. Robinson ). 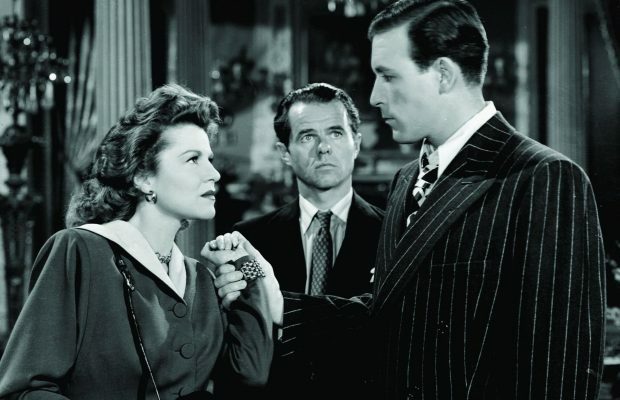 The woman dubbed by many “Queen of Noir” gives the part a heartbreaking quality that makes her stand out among the likes of scene stealers Robinson, Humphrey Bogart , Lauren Bacall , and Lionel Barrymore . Claire Trevor (1910-2000) arrived in Hollywood in 1933, and almost immediately became a star. Her early credits include playing Shirley Temple’s mom in BABY TAKE A BOW (1934), the title role in the Pre-Code drama ELINOR NORTON (also ’34), Spencer Tracy’s wife in the bizarre DANTE’S INFERNO (1935), and the reporter out to expose a human trafficking ring in HUMAN CARGO (1936). Claire’s turn in the small part of Francie, gangster Baby Face Martin’s ex-girlfriend turned syphilitic prostitute in 1937’s DEAD END, earned her the first of three Oscar nominations. In John Ford’s STAGECOACH , (1939), Claire takes top billing as another prostitute, Dallas, who falls for John Wayne’s Ringo Kid. This was The Duke’s breakout role, and the two became lifelong friends, acting together again in ALLEGHENY UPRISING (’39), DARK COMMAND (1940), and THE HIGH AND THE MIGHTY (1954), which garnered Trevor her third and final Oscar nomination as world-weary actress May Holst. Film buffs love her best for her many roles in the shadowy world of film noir, like the duplicitous Mrs. Grayle in 1944’s MURDER, MY SWEET . Bad girls were her specialty, none badder than her turn as Helen Trent opposite Lawrence Tierney’s psycho Sam Wilde in 1947’s BORN TO KILL . She was the murderous Ruth Dillon in STREET OF CHANCE (1942), the greedy golddigging wife of Marvin Miller in JOHNNY ANGEL (1945), and escaped con Dennis O’Keefe’s girlfriend/accomplice in 1948’s RAW DEAL . Gaye Dawn is a much more sympathetic figure than Claire’s usual bad girls. We first meet her sitting at the bar inside the nearly deserted Hotel Largo, already intoxicated and babbling about horse racing to Bogie’s ex-war hero Frank McCloud. The hotel has been taken over by hoods in the employ of Johnny Rocco (Robinson), a preening, swaggering deported gangster who has snuck back into the country to pull off a counterfeit money scheme. Rocco uses and abuses his once glamorous girlfriend, now gone to seed and trapped in an alcoholic hell of her own sad devise. The sadistic Rocco humiliates Gaye when, as she begs for a drink, he belittles her and forces her to sing for her booze. The ex-torch singer seems bewildered at first, then pathetically starts to croon the jazz standard “Moanin’ Low” in a decidedly off-key manner, obviously suffering from the pains of her addiction. Rocco then refuses to give her a drink, stating “You were rotten”, and the faded flower bursts into tears. McCloud, feeling sorry for the devastated Gaye, gets up and pours her a drink, only to receive a few quick slaps from Rocco. It is heart wrenching to watch Claire as Gaye be degraded so hatefully by the sociopathic Rocco, and this scene no doubt nailed the Best Supporting Actress Oscar for her. Later, when Rocco forces McCloud to transport him and his mob back to Cuba via boat, he refuses to take the pitiful Gaye with him. She gets a measure of vengeance when, pretending to throw herself at Rocco in a last-ditch attempt to return to his good graces, she lifts his gun and surreptitiously gives it to McCloud. Her bravery sets the stage for the final denouement at sea, where McCloud singlehandedly takes on Rocco and his men. 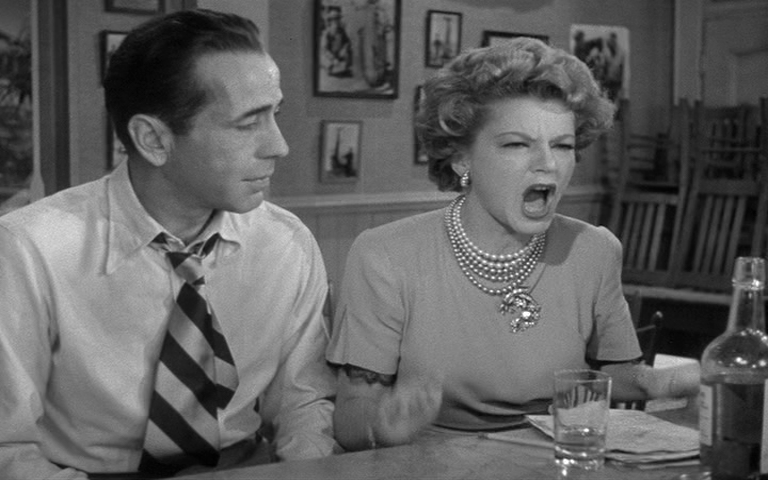 The woman scorned has become a woman redeemed, and Claire Trevor becomes just as much the hero of the piece as Bogart himself. KEY LARGO was nominated only for Trevor’s marvelous performance, though cases could surely be made for Robinson’s Johnny Rocco, Huston’s taut direction and screenplay (with Richard Brooks ), Karl Freund’s moody cinematography, and Max Steiner’s fantastic score. The main reason behind this snubbing was that another Huston film of 1948, THE TREASURE OF THE SIERRA MADRE, cancelled it out, gaining four nominations and winning Huston the Best Director and Screenplay that year, not to mention Best Supporting Actor for his father Walter Huston . 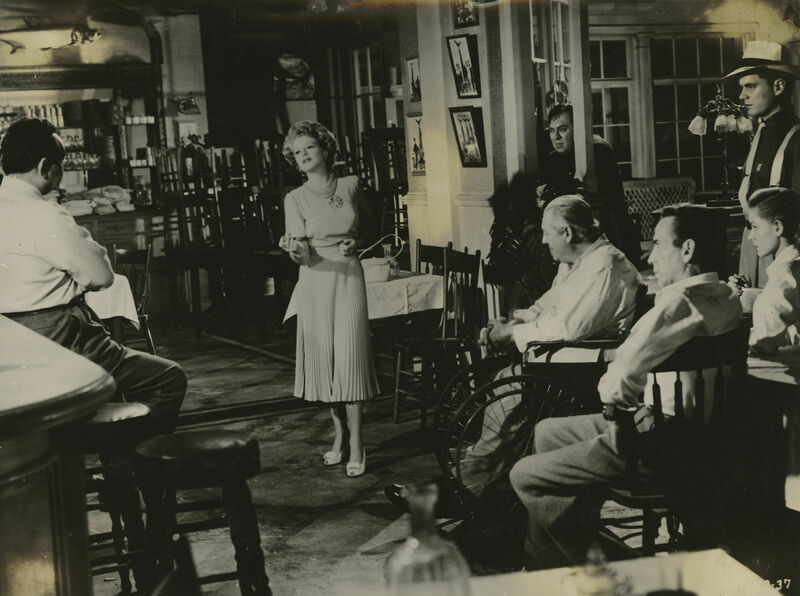 KEY LARGO can certainly stand on its own merit as an all-time great movie, and Claire Trevor’s incandescent playing of the broken Gaye Dawn ranks as one of Oscar’s most memorable screen performances. Great year for John Huston! Two superb movies. I do find strange that Bogart (brilliant in Treasure of Sierra Madre) and Robinson (superb as the gangster in Key Largo) were ignored by the Oscars! Anyhow, I’m glad that Trevor did get the Oscar. I think I’ve got this on the DVR and haven’t gotten around to watching it. Got a huge stack of stuff to sift through. I think I’ve written 3 posts on this film in 2 years! So great. Love your tribute to Trevor. She’s wonderful. My favorite trio of her films are Key Largo, Born to Kill, and Stagecoach. The latter is one of the only John Wayne films I can bear. 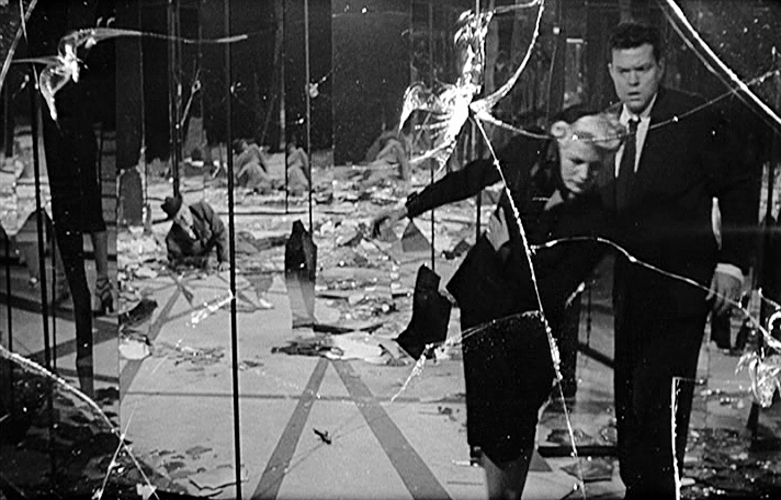 A beautifully written piece on a performance for the ages in a continually engrossing film. 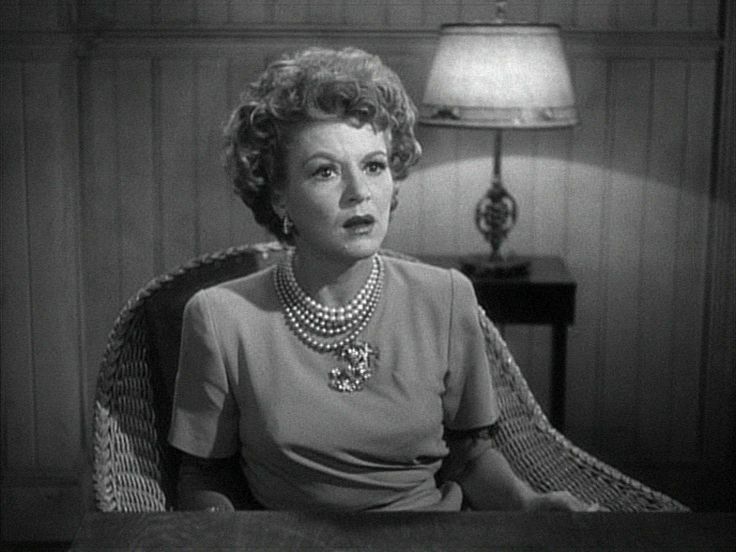 I LOVE Claire Trevor in this film, and so glad she received Oscar attention for her role. 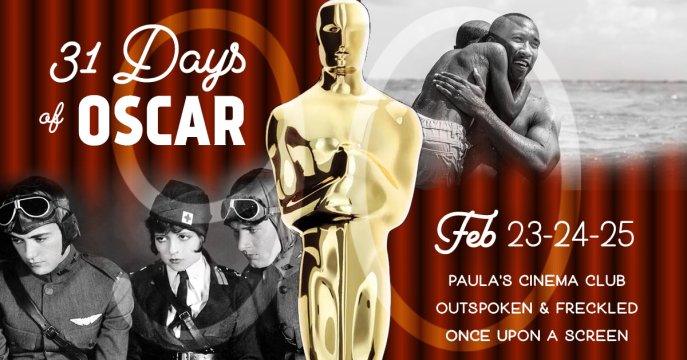 Like you said, this is an incredible movie, but 1948 would be a tough year for Oscar voting, I think. So many stellar films that year. Trevor breaks my heart in KEY LARGO and your piece did as well, such a beautiful tribute it is. Anything this woman is in is worth seeing just for her. She is one of Hollywood’s all-time greats. This is a wonderful contribution to the blogathon. Thank you!